Whether you’re an avid, skilled hunter or looking to varmint hunt on your own property, being able to see your target clearly is key. Especially at night. Many hunters and even service people can talk long and hard about the benefits of a reliable night vision scope. But what you truly need is one of the best Gen 2 night vision scopes. 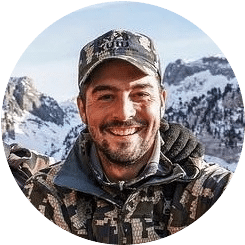 For many recreational hunters, investing in a scope can mean spending a large chunk of change. With that the case, finding a sight which offers quality performance without breaking the bank is crucial. Here, we will discuss the best gen 2 night vision scopes available. We’ll look at handheld or helmet mountable scopes and gen 2 night vision rifle scopes which mount to your weapon using standard Picatinny or Weaver rails. When looking at riflescopes and handheld scopes, understanding your needs will be extremely important. 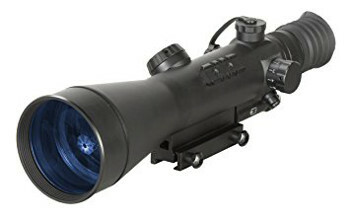 If you need a scope which provides night vision but doesn’t need extreme magnification that will affect your decision.On the other hand, if you need the best magnification available you’ll need to be prepared to deal with not only the cost of that item but the weight. So, where do you begin when you’re looking at your next scope? The first step to choosing the best scope for your needs is comparing the top of the line products. Let’s dive in. 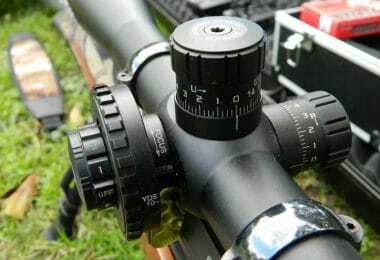 When you’re looking for a new scope and want the best option for your unique needs, there are a few things to consider- weight, magnification, battery life, resolution, and mount options. While each gen 2 scope can offer a great deal, focusing on the more practical aspects of the piece can help you to determine if the scope is the best fit for your situation. 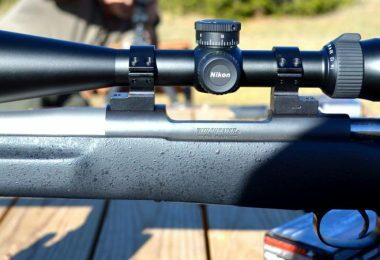 The weight of a scope can make a big difference, especially if you plan on mounting it. The average scope with a decent amount of magnification weighs around three pounds. This can make a weapon feel a great deal heavier. If you want to avoid that, consider a handheld or helmet mounted a scope. However, some of the best gen 2 options have varying weights so you’ll need to compare the options. Additionally, keep in mind that even shaving off a few ounces can make a big difference in how heavy your weapon feels. Magnification is a critical aspect of any scope. Something to keep in mind, the greater the magnification the more the scope will weigh. This is because of the lenses needed to achieve the magnification. When looking for extreme magnification, be prepared for a heavier scope. In fact, many of the stronger magnification scopes discussed weigh an average of 4 lbs. Magnification can also vary greatly from model to model. Some will offer a small boost of 1x and some can boast up to 6x. To help you determine which magnification level will be right for you, think about how far away you will typically be from your target. If you will be quite a distance away than 4 or 6x magnification would likely be best. When using a scope out in the field or when hunting, it will be important to know that the device will not die in the middle of your time out. The average length of time a scope can run for off a standard 3V battery is 30 hours. However, this time will be cut in half if you using a feature like IR illumination. With this advanced feature, many users find that 15 hours is the absolute max. Additionally, looking for a device which will warn you of a low battery will also be helpful. While it may seem like this should be standard, some of the models do not feature this indicator. This low battery warning is particularly helpful if your excursions will last for a few days. The resolution or clarity of the image you view through the scope will also be especially important. If the image is unclear, you may not be able to determine what you are looking at. Second generation scopes have superior resolution with stats around 40 to 50 lp/mm. When using pieces with an image intensifier this number can reach 72. However, the price tag will also likely increase. You will want to evaluate a reasonable resolution for your needs and compare scopes within your budget. Additionally, when looking for advanced resolution or enhanced imaging, devices which offer IR illumination and/or image intensifier tubes are great choices. The IR illuminator option provides superior resolution in complete darkness and the image intensifier tubes increase resolution during regular use. The mount options for a scope will be important to consider if you will be actively hunting or engaging a target during your entire time out. If this is the case, you won’t want a scope which needs to be held. Look for a scope which can be mounted to a helmet, or if you don’t mind the added weight, a scope with a rifle mount. Additionally, if you are planning on mounting the device to your weapon you will need to look at the types of rails the device supports. There are many riflescopes which fit standard Weaver and Picatinny rail systems though some will fit either and some will work on both. Below you will find an in-depth look at the best scopes on the market. We’ll list the key features of each device in addition to the benefits and downsides. If you are a hunter or a competitive shooter, you need a scope to help you find your target during the day or night. Below you will find an in-depth look at the best scopes on the market. We’ll list the key features of each device in addition to the benefits and downsides. Best use: Professional applications and hunting. 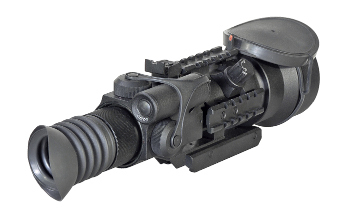 The ATN Night Spirit is a night vision tool with several uses. The device can withstand rough transport and can be hand held or head/helmet mounted. The IR illuminator provides detailed vision in restricted, unlit areas. The scope is waterproof and uses a 1.5V AA size battery, which is included. The battery life is 30 total hours, or 15 when using the IR illuminator. It also provides automatic brightness control and bright light cut-off features. The scope provides quality night vision with a quick to adjust focus. The pulling turn knob used to activate the IR illuminator is also difficult to accidentally trigger, potentially using up your battery. The key downside to this product is that some of the pieces have been manufactured with black specs affecting the sight and some have had issues with loose screws. Because of these issues, this scope has been discontinued and is only available for resale. To guarantee quality, you may want to consider the Night Arrow options or look at other models available through ATN. Best use: Advanced sports shooting and hunting. The rugged ATN Night Arrow is simple and easy to use thanks to the single knob operation. The sight provides superior observation, aiming, and target acquisition abilities. This riflescope is a solid choice when looking for the best in optics, performance, and tubes for the avid hunter. The device is compact, water, and fog-resistant, and finished in a nonreflective matte black. The illuminated center red reticle provides optimal contrast against light or dark targets. The illuminated red center reticle is also in addition to a red on green reticle system. It mounts to the weaver rail and uses a single AA-type battery. The battery life is the standard 30 hours. It also includes a detachable infrared illuminator. A downside for this scope is the weight. At 3 lbs., this sight can make a weapon feel heavier. If you’re looking for a lighter weight scope, consider going down in magnification as many of the 4 to 6x magnification sights are similar weights. However, it is important to mention that at similar scopes and those which offer 6x magnification can also be heavier. If this magnification is a must for you, you will simply need to account for the extra weight. Related: To keep getting the most accurate shots you’ll want to keep your scope clean. In order to help out with that consider the Nikon Lens Cleaning System. Best use: Varmint hunting and nocturnal game hunting. 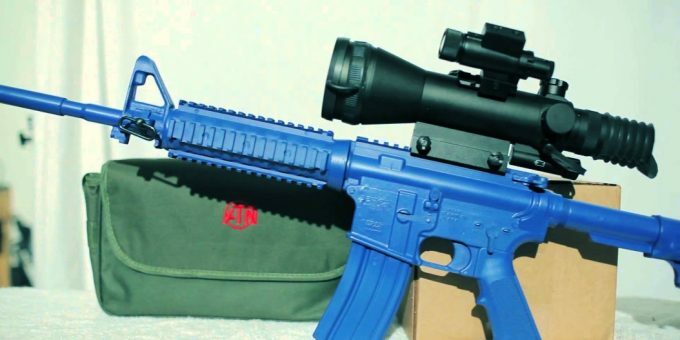 This scope, created for the U.S. Military, is available for civilian hunters. The PVS-4 Night Vision Scope offers a resolution of 36 lp/mm minimum and 4x magnification. It is suitable for wide range of weapons including 7.62mm and 5.56mm rifles in addition to light machine guns. The lenses offer top clarity thanks to their enhanced multi-coated features. The device uses a CR123 lithium 3V battery, though battery life is not officially listed. The built-in rail mount can attach to any Weaver or Picatinny style rail. The piece is water-resistant and the internally lit, range finding reticle can be interchanged to accommodate several weapons. 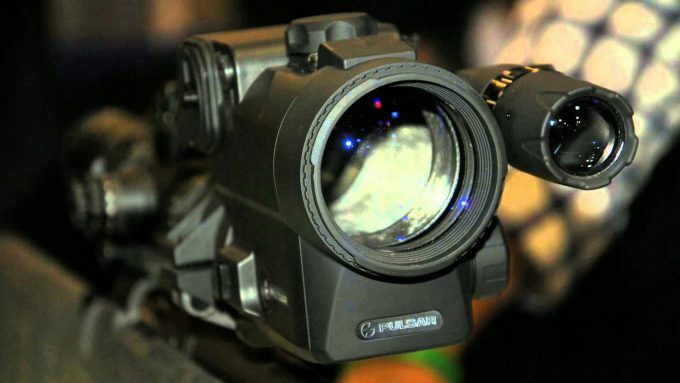 The PVS-4 scope is also very durable and designed to stand up to repeated wear and tear. 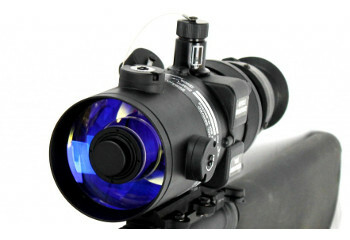 It offers adjustable reticle brightness, bright source protection, and adjustable image tube brightness. The key downside to this piece is that many of the items available on the market have been refurbished. This means the quality and reliability of the device is not guaranteed. While this device does offer superior features, it frequently generates a “collector item” price tag because the item was not originally marketed for the public. Plus, very few are available through retailers for purchase because they were chiefly designed for the military. Best use: Home security, law enforcement, and hunting. The ATN PS28 Day/Night offers a great option for those looking to go from day to night vision easily. This is the next generation of the popular ATN PS22 night vision clip-on line. The scope mounts in front of a daytime scope and doesn’t require any re-zeroing or shift of impact. The scope is made with a fast catadioptric front lens system and offers a quick release mount. Also available is the optional scope mounting system which is used to couple with the objective of the day scope. The scope provides a resolution of 40 to 45 lp/mm. 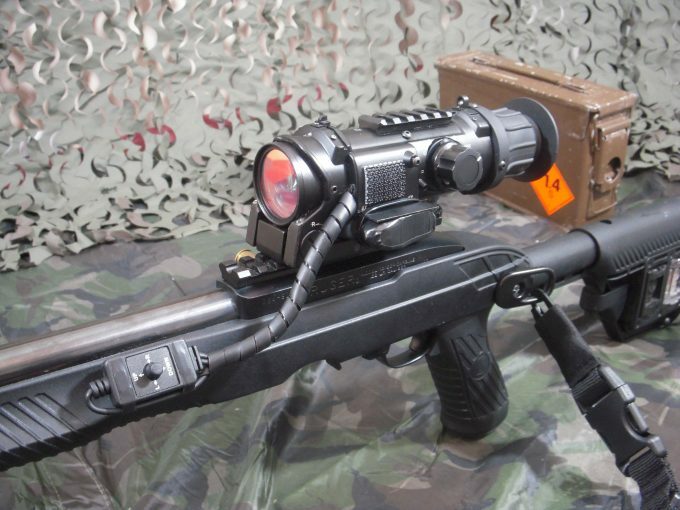 It also uses the ATN infrared illuminator to provide increased clarity and with this scope the IR illuminator is detachable. The scope runs off a 3V CR123A battery and battery life extends to 50 hours. The device is also water-resistant. 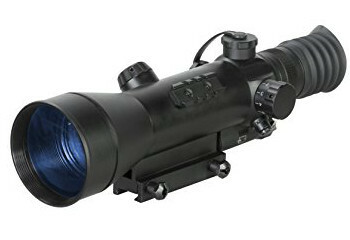 Additionally, the scope provides automatic brightness control and bright light cut-off. The main downsides to this device are the lower grades of magnification and the lack of a low battery indicator. The scope offers superior resolution however it simply will not magnify as much as some of the other scopes available. 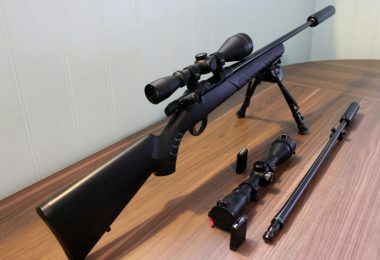 If you are not looking for assistance with long-range hunting then this scope could be a good fit. The lack of a low battery indicator can be problematic, however. The low battery indicator on most devices is especially useful if you plan to be out for great lengths of time, such as a few days in a row. Because this device does not provide this indication, you will need to keep track of how long you have been using the device and deal with the low battery accordingly. Related: If you are looking to mount a scope onto the PS28 than you will want to look into picking up a ATN PS28 Scope Mounting System. When looking for the superior scope for long-distance hunting, the Armasight Nemesis Night Vision is an amazing option. The powerful 6x magnification offers a 6.5-degree FOV. The scope also features an image intensifier tube for improved resolution, at 45-51 lp/mm, and clarity. 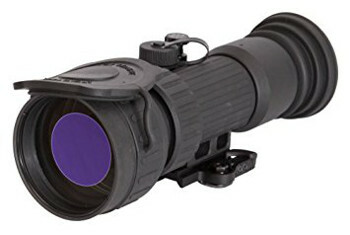 The device also provides shock protected optics and features auto brightness control, bright source protection, and an illuminated center red cross reticle for optimal contrast. In fact, the adjustable brightness illuminated reticle is unique. 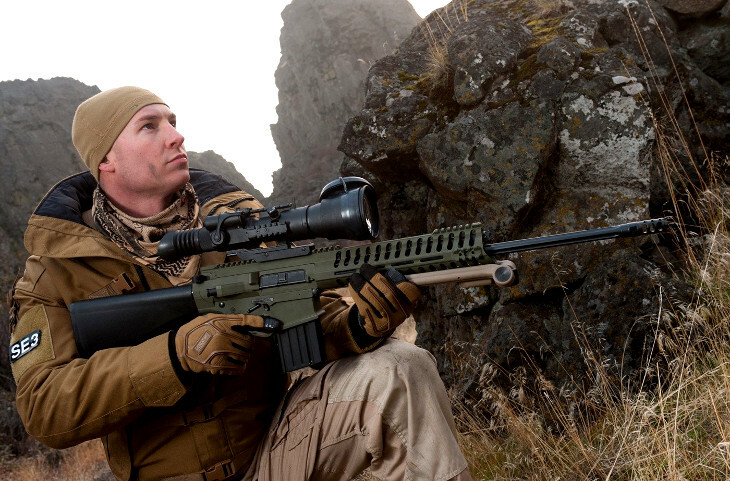 On the market, there are no other night vision rifle scopes with such well-defined and particularly thin crosshairs. Many a hunter has said that this allows for precise shot placement, even on very small targets. The body of the device is waterproof and operates with easy to use push controls. The scope mounts to any standard Picatinny or Weaver rail. The Nemesis6x runs off a 3V CR123A battery and the life extends to 60 hours. This is a great choice for hunters looking for advanced magnification, resolution, and battery life. The main downside is again weight. The device comes in at 4.2 lbs., making it heavy for most users. The determining factor would be if the weight is worth the magnification and visual distance. If you are planning on being in a stable position or using a bipod stand for your weapon, the weight will not be as serious a downside. Related: When not using this sight or during travel you’ll want a secure location to store it. The Mil-Standard Hard Shipping Case will keep it safe if you are just storing it between uses or traveling to your next hunt. 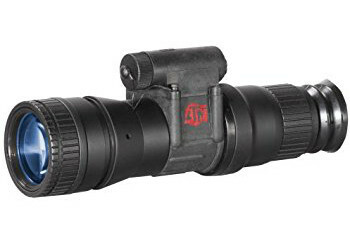 The ATN Night Arrow is a durable night vision riflescope which offers superior target acquisition, observation, and aiming capabilities. This is a great choice for a sports shooter or varmint hunter looking for the magnification to support long distance hunting. The design of the piece is light and compact and offers top-notch performance with this high level of magnification. The external surfaces are finished in the ATN non-reflective matte black. The scope provides a red on green reticle system with 1/6 MOA adjustment. The device also comes with the ever-important automatic brightness control which ensures the life of your scope. There is single knob operation provided along with an illuminated center red reticle for the optimal contrast of light or dark targets. The ATN Night Arrow 6-2 mounts to standard Weaver rails and uses a single AA type battery, which lasts an average of 30 hours. It is also water and fog resistant. The main downside to this piece is that the battery life doesn’t provide a large time frame. The run time of 30 hours will also be reduced if you are using the detachable IR illuminator. Reducing the time to 15 hours could affect a hunter or professional who will need to be out for an extended time and cannot deal with a failing battery. However, while many 6x magnification devices can weigh around 4.5 lbs., this device only weights 3.8, making it a little lighter. Related: In order to keep your scope spotless and giving you the best views you’ll want to keep it nice and clean. To help out with that consider the Vortex Lens Cleaning Pen. There you have it. As you’ve seen there are quite a few different options available which can suit a variety of needs and situations. There are a great number of products available for mounting right to your weapon and there are options which can be handheld or mounted to a helmet. You’ve also seen that the magnification options are especially varied and that with this greater magnification comes a decent amount of weight to add to your already weighty weapon. As you’ve also seen there are several similarities among the products. In fact, because many of the scopes are made by a single company, ATN, they are made with a great number of the same features. As you’ve also probably seen, a few of the features can be considered standard and should be a feature of whatever scope you choose. For instance, automatic brightness control and bright light cut-off. Did we miss any great products out there? Let us know what to include in the comments below.